We have been watching the demolition around Kellogg's Diner at Metropolitan and Union Avenue, knowing that the Chetrit Group is planning a large building for the site that would have a significant retail element. 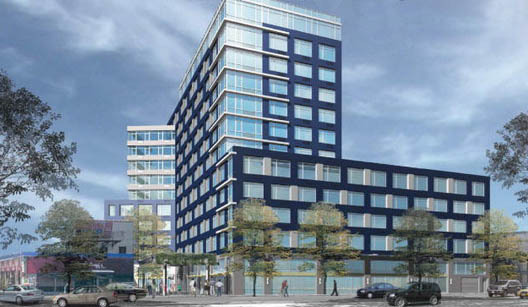 We posted an early rendering of the frighteningly ugly building last year. Yesterday, a reader pointed Curbed to an updated rendering of the building. 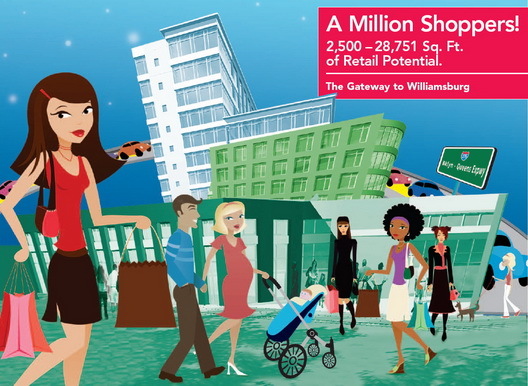 We're not sure what's more interesting: the building itself, the 24,000+ square feet of retail that could end up on the site or the cartoonish pitch for the "Gateway to Williamsburg" by the Winnick Group. We can't say we've ever seen anything selling Williamsburg that looked quite like that nor did we ever think we'd see anything like it.